These Banana Blueberry Pancakes are a sweet way to start the day! So sweet, in fact, that you can’t even tell they’re made without sugar! They’re naturally sweetened through the use of super ripe bananas and blueberries that have been heated almost to bursting. I added a little Lakanto Golden Monkfruit Sweetener to my batter (or you can use xylitol 1:1, or Gentle Sweet in half the amount), and the result is a pancake sweet enough to eat hot off the griddle. No need to dress it up with sugar-free maple syrup for sweetness’ sake, but let’s be honest here: pancakes are meant to be doused! 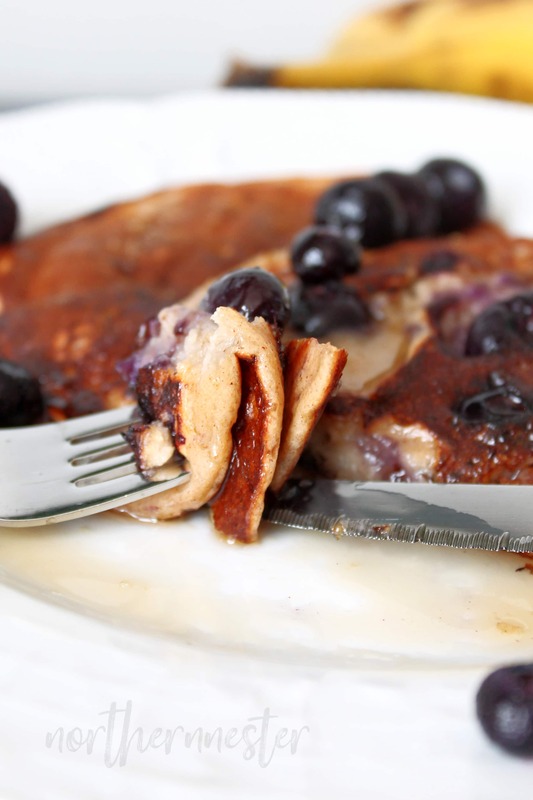 These Banana Blueberry Pancakes are also gluten-free if you use gluten-free oat flour. Don’t have oat flour? You can easily make it yourself by dumping gluten-free oatmeal in the blender and blitzing it into a powder. Speaking of blenders, the Banana Blueberry Pancake batter is entirely made up in one! That means a super smooth batter and very few dishes! Win-win. First puree your bananas, add all the other ingredients (except the blueberries) on top, give it a whirl until completely combined, and your batter is ready for frying. After you pour your batter onto a hot, non-stick frying pan or griddle, sprinkle a few blueberries on the top of each pancake while the underside cooks. You can use fresh or frozen for this. Your pancake is ready for flipping when bubbles appear on the top and the edges begin to look dry. I recommend using medium heat (I set my burner to 5/10) for these so you don’t scorch the outsides before the middle is cooked. The recipe will yield a dozen, medium sized Banana Blueberry Pancakes. Trim Healthy Mama recommends limiting yourself to half a banana in an E meal, so that means you can have 2 pancakes per serving. You can make the whole batch and serve it to your family for breakfast, or freeze your leftover pancakes in an airtight container or bag with a piece of waxed paper between each one so they don’t stick together. They’re even better reheated in the toaster or microwave – a quick, make-ahead breakfast! These pancakes are a delicious way to start a morning with energizing carbs! Banana and blueberry go so well together. There's so much natural sweetness in these pancakes, you may not even want to top it with sugar-free maple syrup. THM: E, GF, Low-Fat. Add bananas to blender. Puree until smooth. Add in egg whites, nut milk, yogurt, vanilla, oat flour, sweetener, baking powder and salt. Blend until completely combined. Pour batter by 1/4 cupfuls onto a lightly oiled hot griddle or frying pan. 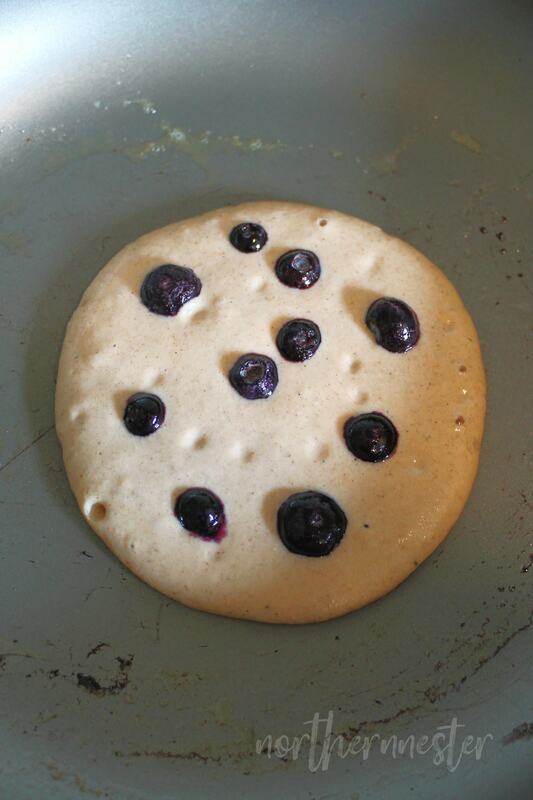 Sprinkle each pancake with several blueberries (if using frozen blueberries, do not thaw). Flip when bubbles form on top and edges begin to look dry. Cook until second side is golden brown. Serve with sugar-free syrup if desired. Notes: You can freeze cooled pancakes between layers of waxed paper in a resealable plastic freezer bag. Looking for more Trim Healthy Mama pancake recipes? We love these ones, too! Simply amazing! THE best THM pancakes i ever had! Do you think THM Baking Blend could be used in the place of the oat flour.